Carnival glass is nearly as volatile as the stock market. Certain shapes, colors, patterns, or makers will be all the rage for a few years and will then level off and in some instances suffer a pronounced decline in popularity. Examples of such changes over the past several years have been tumblers, Grape and Cable, water pitchers, and to some extent, Millersburg. It is often a matter of “out of sight — out of mind.” A few years ago, Millersburg was the hottest thing in Carnival. After Jack Wilson sold his collection in 1982, followed by Ed Garner in 1983, and then followed in 1984 by the death of O. Joe Olson, Millersburg has received little or no publicity. Bill Edwards’ Millersburg book in 1975 did much to fan the flames. 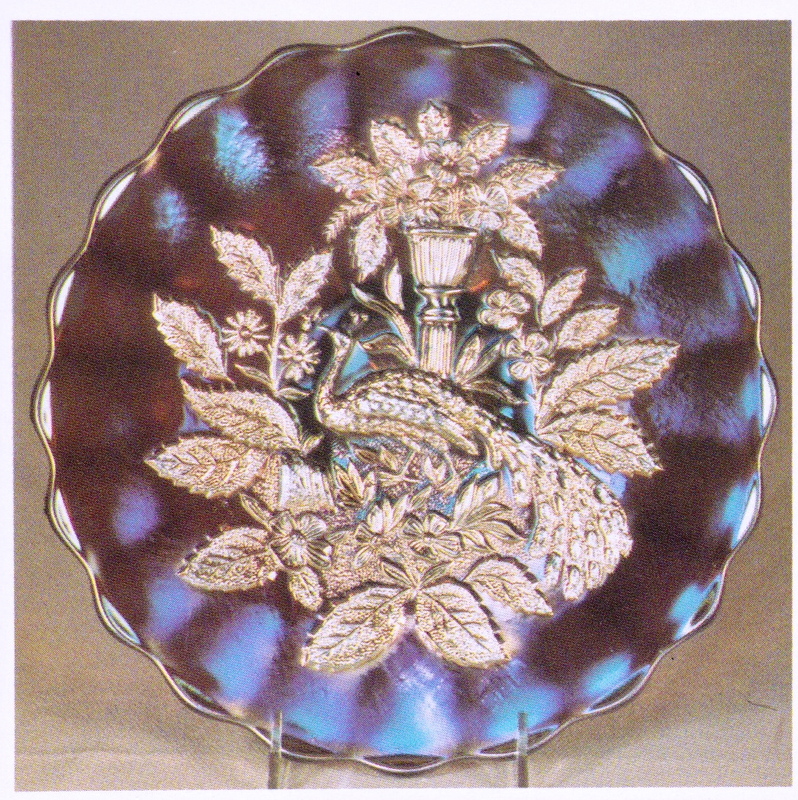 Since this period, other items such as the pastels, Northwood Peacocks pieces, red, and Hearts and Flowers pieces took the spotlight. Millersburg went into a “holding pattern”. It has received so much less attention than it did previously that those wiwth large Millersburg collections have sat quietly on the sideline just waiting for this giant to stir and command the attention it deserves. In my opinion, this day is not far removed. The quality, the beauty, and the limited availability of Millerlsburg carnival makes such inevitable. DIAMOND – Most collectors are familiar with the water set in this pattern but will be as startled as I once was, to learn that it was also made in a punch bowl and base. 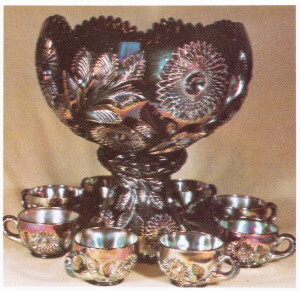 No cups have ever turned up in any color but a couple of bowls and bases are known in green and amethyst, in addition to the marigold pieces shown here. This marigold bowl and base sold at the ACGA auction in 1986 along with six tumblers for $1660. The previous owners insist that the set was original. Since no cups have surfaced, it may well have been designed to be used with tumblers. I have not shown the tumblers here, as it still will take a little more getting used to this combination. 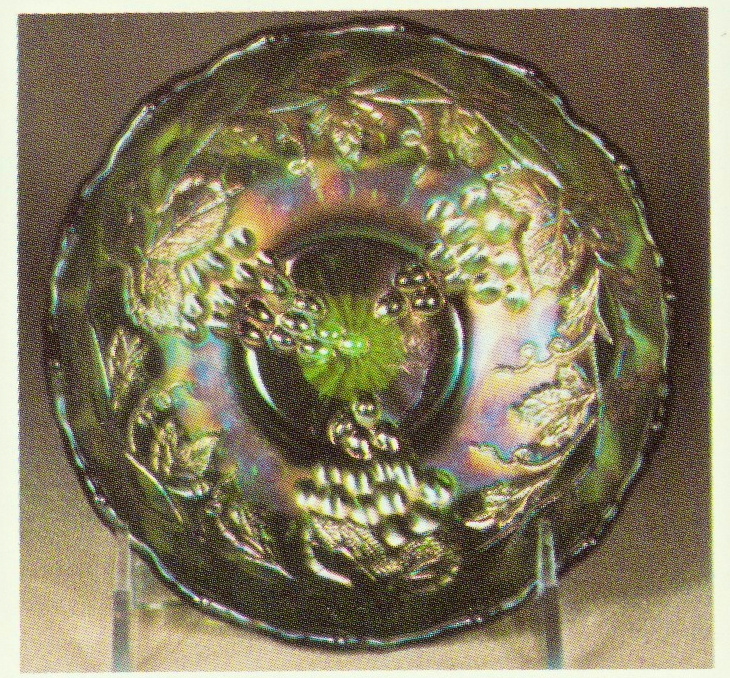 SEAWEED – The Seaweed bowl is known in three sizes — 10 1/2”, 9”, and a 5 1/2” sauce. 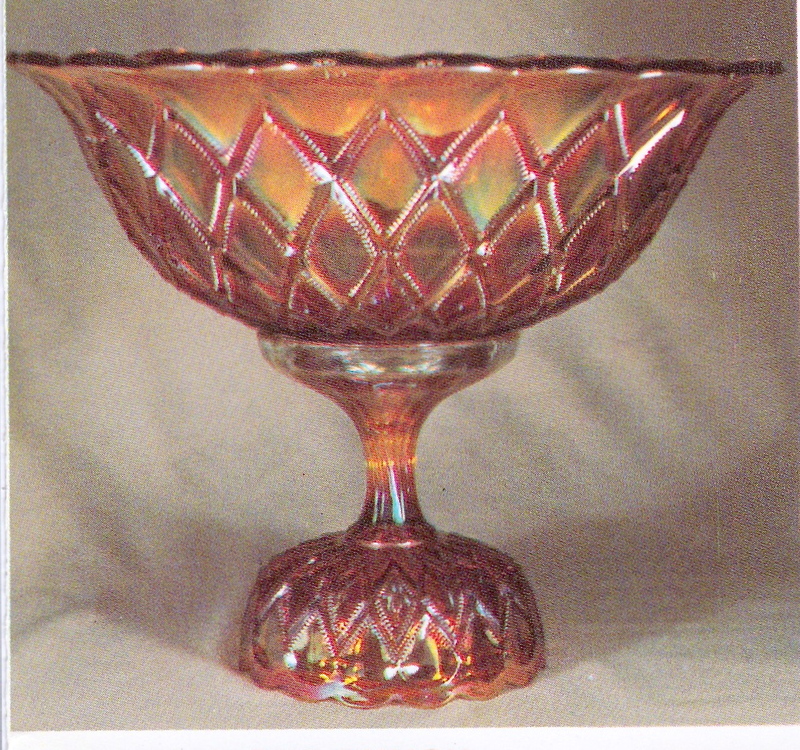 The large size bowl is almost invariably ruffled but a few have surfaced in the ice cream bowl shape. The one here in marigold sold at the Carroll auction in 1983 for $300. The only other one in this shape, that I have seen, is a super blue one that brought $900 at the Garner auction, also in 1983. Any blue Millersburg is, of course, rare. The 9” size in this pattern is seldom seen and the sauce is really rare. 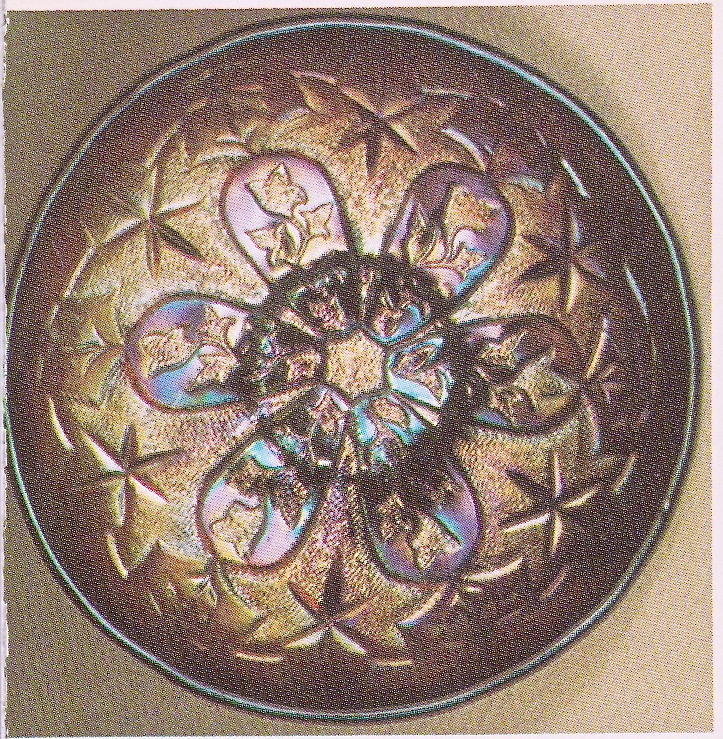 Now and then the 9” bowl is found in a “plate shape” that turns up slightly at the edge. 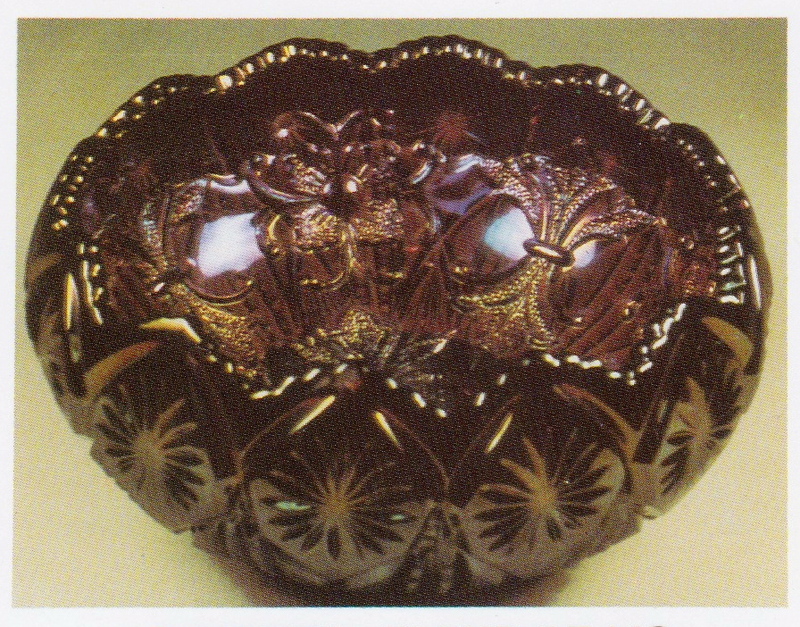 HOBSTAR AND FEATHER – This giant rosebowl, like the one in the Venetian pattern, is an unique carnival shape. Like all the pieces in this pattern, the glass is heavy and the cut is deep. It is known in green, marigold, and amethyst. A green one brought $2000 at the Jenkins auction in April, 1983. Three or four rare vases are known. These were swung from this giant rosebowl. Also two very rare spittoons (some might call them vases) have been found that were shaped from this same piece. MORNING GLORY – If there is a carnival water pitcher which stands out from the others, it would have to be the Morning Glory. Its unusually tall and graceful lines are outstanding. The pattern is well adopted to the regal elegance of this rare piece. Shown here is one of four (one is cracked) know in amethyst. Three are confirmed in marigold, and only one in green. They are seldom offered for sale and prices will range from $6000 to $10,000. BIG FISH – This pattern is easily confused with Trout and Fly. It is very much harder to find. There are a number of differences, but I have found it helpful to remember that the fish in the Big Fish pattern is, quite ironically, smaller than the one in Trout and Fly. So the Big Fish, in reality, is the little fish. The square shape shown here is quite rare. To my knowledge it is the only square Big Fish in green. It sold privately for $1000 in 1986. 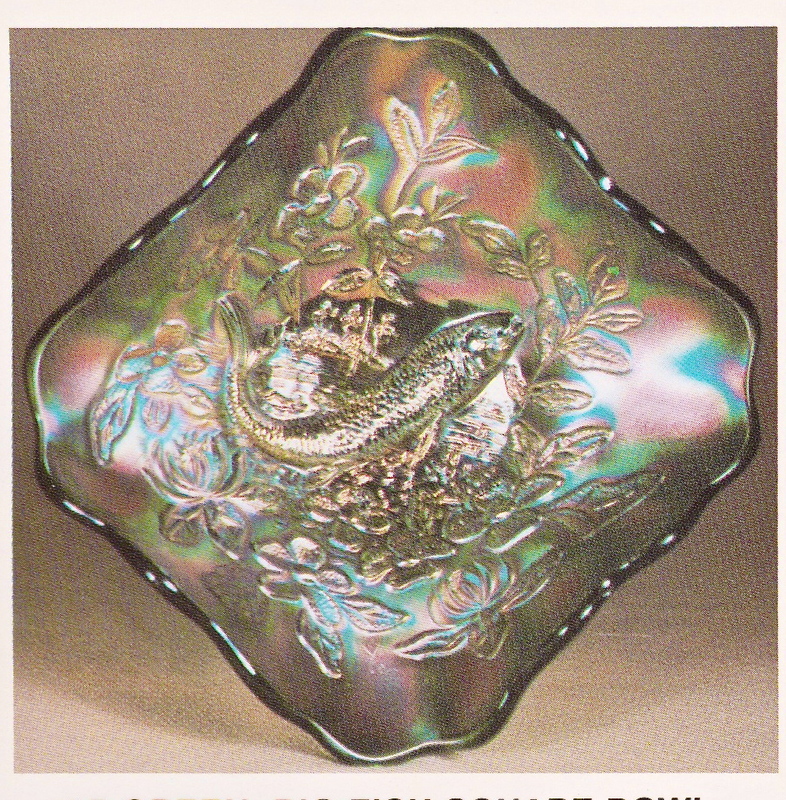 LITTLE STARS – This bowl is quite readily found in the 7 1/2” size. 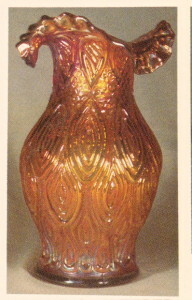 The three other sizes (10 1/2”, 9”, and a 5 1/2” sauce) in which this pattern is found are all rare. One of the two known sauces is shown here. They are amethyst, and each sold for $350 in 1986. Do not confuse this pattern with Millersburg’s Many Stars, as they are very different. MILLERSBURG VINTAGE (HOBNAIL BACK) – This is another of the Millersburg super sauces. The master bowls in this pattern are also rare, but not to the same degree as the sauces. In addition to the one shown here in green, I know of one in amethyst and one in blue. The green one sold at the Wilson auction in 1983 for $425. MILLERSBURG PEACOCK AND URN – This is my all time favorite piece of carnival. It is pure elegance and beauty. Connie lives in constant fear that in the event of fir or earthquake, I will grab it instead of her. 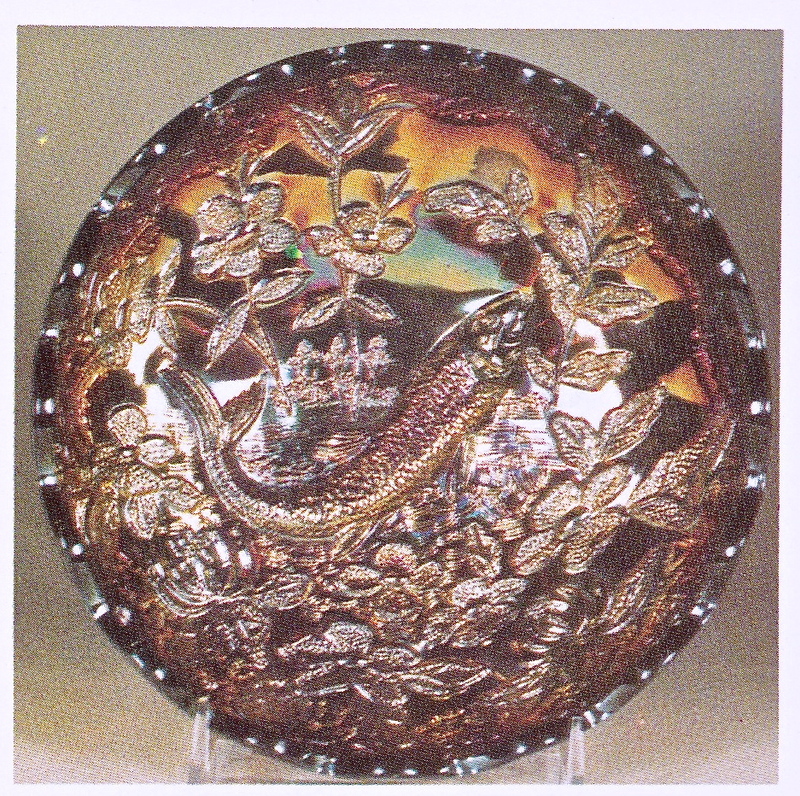 The chop plate shown here is one of three known in amethyst. The owner of one of the three turned down $5000 for hers. I feel it could well bring $6000 or $7000 at auction today. It is also very rare in marigold with some four or five confirmed. It will sell in the $2000 to $2500 range. You have to see this piece to appreciate its stunning beauty — but just stick around awhile and you probably will. I take it to every program I do, regardless of the subject. ROSE COLUMN VASE – This handsome vase is more rare in marigold than in amethyst or green. They will sell in the $1200 to $1500 range. A single blue one brought $8000 at the Wilson auction in 1982. I understand a second blue one has been reported. 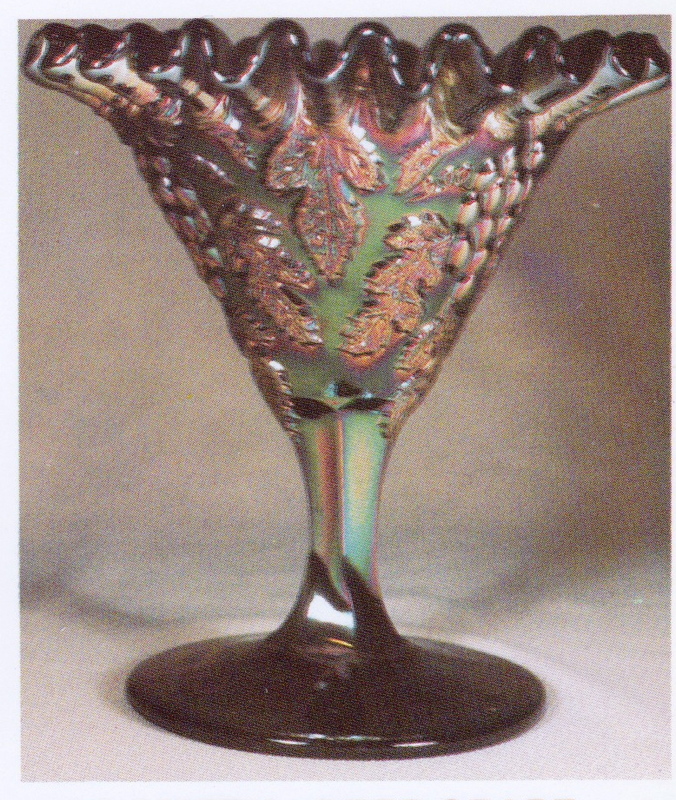 There is also one experimental vase in amethyst with colored flower and leaves. HOBSTAR AND FEATHER PUNCH SET – Very rare in any shape, but particularly so in the tulip shape top as shown. This shape is known only in amethyst and is valued at some $6000. Flared shapes can also be found in marigold and green. 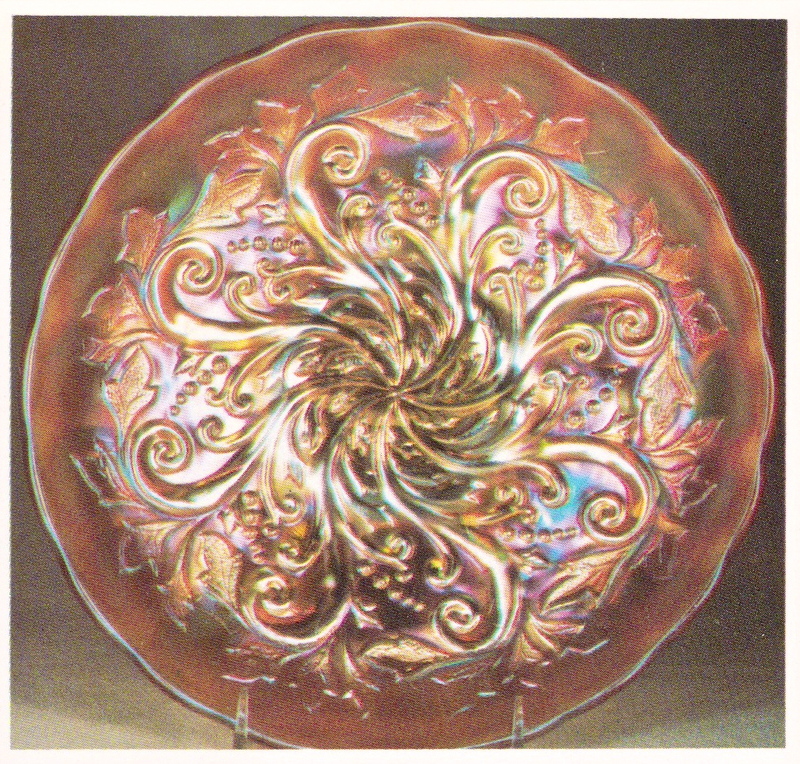 Now and then these flared shapes will carry the Fleur de Lis pattern on the interior of the bowl. One rare vaseline base is known in this pattern. 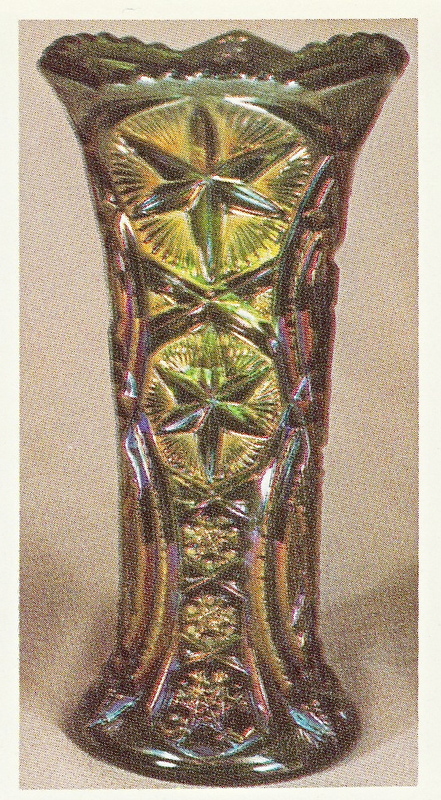 OHIO STAR – This vase is found in green, marigold, and amethyst. Value — $500 to $750. Two extremely rare ones are known in aqua opal The owner rejected a $10,000 offer for one of them several years ago. Three or four vases have been swung into a rare tall whimsey shape. These are green and amethyst. 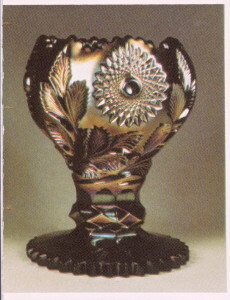 A rare marigold jelly compote was also made in this pattern. BIG FISH – The shape of the amethyst bowl shown here is very unique. It is a deep round piece that doesn’t miss too much of becoming a rosebowl. It sold privately a few years ago for $800 at the Spierling auction in 1982. 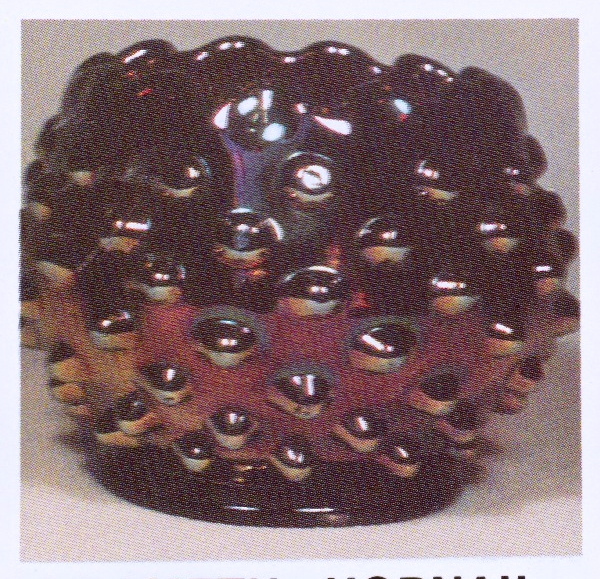 SWIRL HOBNAIL – This comes in three different shapes, all from the same mold – ladies spittoon, rosebowl, and vase. These various shapes are found in green, marigold, and amethyst with green the tough one to find. 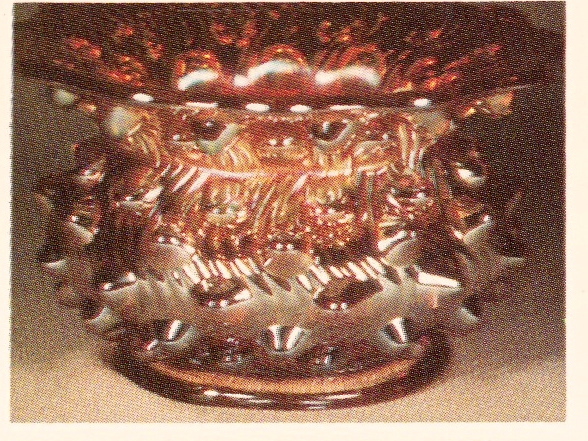 An amethyst spittoon sold for $800 at the Spierling auction in 1982. HOBNAIL – A touch easier to find than the Swirl Hobnail, it too was made in the three different shapes from the same mold. In addition to these shapes, this pattern was also made in a rare table set and water set. These sets are known in blue, but the vase, rosebowl, and spittoon are confined to the three more standard colors. The rosebowl, as shown here in amethyst will sell from $350 to $400. 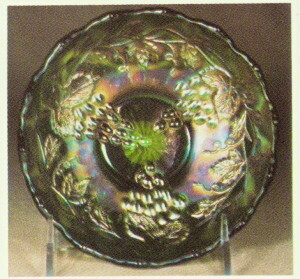 DEEP GRAPE – The piece shown here is very rare as it is the only one known with the crimped top. It sold privately in 1982 for $1800. 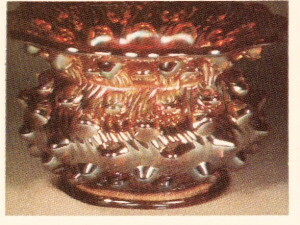 The standard compote in this pattern has a plain top and may be in either a round or a square shape. The standard shape in marigold, green, or amethyst will range from $650 up to $1000. This piece has been reported in blue, but I have never seen one in that color. One very rare rosebowl-shape in amethyst is owned by the Britts in Kansas. PERFECTION – This is another of the great carnival water sets. 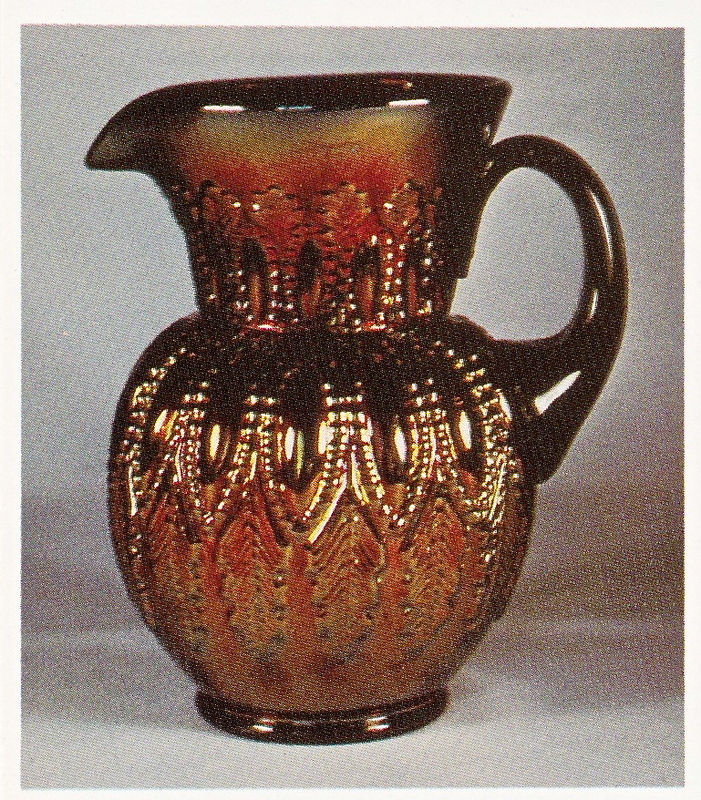 Like so many of the water sets produced by Millersburg, this pattern was not used on other shapes. It is found in green, amethyst, and marigold. All are rare but the green and the marigold are nearly impossible. Full sets in any color are almost non-existent. 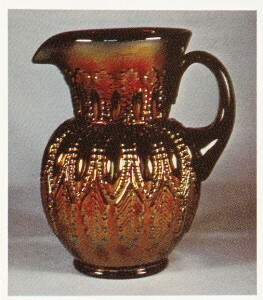 An amethyst pitcher, as shown, sold at auction in 1985 for $3200. 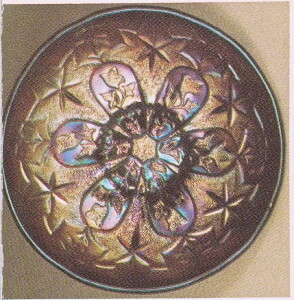 FLEUR DE LIS – Only two rosebowls are known in this pattern. The one shown here on a collar base sold at the Wilson auction in 1982 for $600. The other one is also amethyst but it is on a dome base. The bowls in this pattern also come in both the collar base and dome base shapes. They may have either a radium or a satin finish. Country Kitchen is used as the exterior pattern on these pieces. MITERED OVAL VASE – This piece is rare, beautiful, and fragile. Few were made and still fewer survived. It is known in green, marigold, and amethyst, with the marigold the rarest of the lot. These pieces are rarely offered for sale. The last one to go at auction to my knowledge was a green one in the Garner auction in 1982. It brought $1800. That’s about it. Just as we are told to buy our straw hates in the winter time, I suggest you buy a piece or two of Millersburg before this sleeping giant awakes.